25 Techniques That Will Unload Your Family Schedule. The life of a parent can not be called simple. Children need to take back to school, to have time to go shopping, do household chores. Then pick up the children from school and take to the clubs and sections. In addition, it is necessary to deal with the rubble stained things, tantrums and toys scattered everywhere. Of course, if you have children, a former light-heartedness you are unlikely to return. But try to simplify some things are quite possible. The good news is that you will succeed no matter how many children you have. Anyone who has kids knows that any life with kids is going to be complicated, at least to some degree. From extra laundry to bathing and cooking and shopping and driving and school and chores and crises and sports and dance and toys and tantrums, there is no shortage of complications. You won’t get to ultra-simple if your life includes children … but you can find ways to simplify, no matter how many kids you have. Take my life, for example: I have a house full of kids, and yet I’ve found ways to streamline my life, to find peace and happiness among the chaos. How is this magic trick accomplished? Nothing magical, actually, but just little things that have simplified my life over the years. The main magic trick, however: making my family my top priority, and choosing only a small number of priorities in my life. If you have too many things you want to do, or need to do, your life will become complicated. But if you choose just a few things that are important to you, you can eliminate the rest, and simplify your life greatly. What follows is a list that might seem complicated to some — 25 items! Trust me, I could easily double this list, but I don’t want to overwhelm you. Instead of trying to tackle everything on this list at once, choose a few things that appeal to you, and give them a try. Bookmark this page and come back to it from time to time to try out other ideas. Best yet, they might inspire new ideas of your own! Self-sufficiency. This one tip could simplify your life greatly, over time. However, it will make things more complicated in the short term. The idea is to teach your kids to do things for themselves as they get older and more capable. Teaching them to do something themselves instead of just doing it yourself takes time and can be a little frustrating at first, but it will pay off for years to come. My kids, for example, can make themselves breakfast, shower and dress themselves, brush their teeth, and generally get themselves ready in the morning with only minimal prompting from us. They can clean their rooms, wash dishes, sweep, mop, dust, wash the car. The older ones can cook basic dishes and babysit the younger ones. This type of self-sufficiency has saved my wife and me tons of time and trouble over the years. One calendar. If you have more than one kid, you might have a lot of activities going on that you need to track, from school events such as Christmas performances and parent-teacher conferences to extracurricular activities such as soccer practice, dance classes, or Spring concerts. Organize your life with a simple calendar (I use Google Calendar) and enter all activities and appointments on this one calendar, from kids’ stuff to your own goings on. When they hand you papers from school, or soccer schedules, immediately enter everything onto the calendar. Then a quick glance at the calendar each day will help you plan your day. Toy bins. 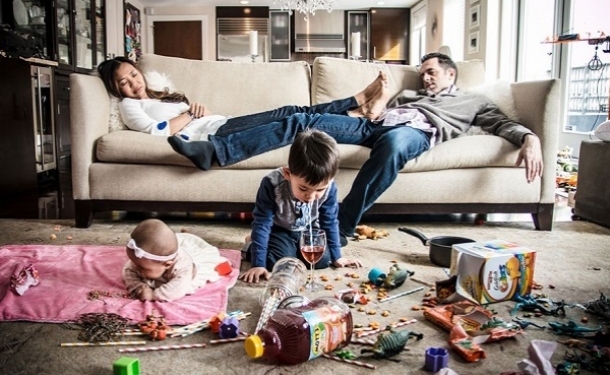 It’s an inevitable fact of life that kids have lots of toys, and that they will be everywhere. You will drive yourself crazy if you try to manage them with dictator-like ruthlessness. Instead, let kids play, but have lots of bins where they can toss the toys inside when they’re done. Then cleaning up is a cinch — they just toss everything on the floor into the bins, and move on to making their next mess. You can have designated bins for certain toys (this one’s for Legos, this one’s for stuffed animals, this one’s for cars), and also have some general-purpose bins for things that don’t fit anywhere else. Don’t be too strict about them — the whole purpose is to make things simpler. Regular cleanups. If you’re like me, you don’t like a huge mess. Teach your kids to clean up after themselves — let them make a mess, but every now and then, tell them it’s time to clean up. Be sure to tell them to clean up before moving on to something else, such as lunchtime or bedtime. It’s good to have regular times during the day when they do cleanups, such as before bed or before they leave for school, so that the house is always clean at night and during the day. Quiet bedtime routines. Kids thrive on routine, and no routine is better than the one before they go to sleep. Have a regular routine before bed — it might consist of cleaning up, showering, brushing their teeth, getting into their pajamas, and reading a book. Reading aloud to them just before bedtime is a great idea, because it quiets them down after a day of activity, it gives you quality bonding time together, and it gets them into the habit of reading. Plus, it’s just something that everyone can enjoy. Prep the night before. Mornings can be a hectic time for parents and kids alike, but they don’t have to be. Instead, prep as much as possible the night before, and have your mornings be a little more relaxed. I like to prep lunches, get their clothes ready (and mine as well), and have them shower, get their homework and school bags ready. Then the morning is simply eating breakfast, a little grooming, getting dressed, and gathering everything together before you head out the door. It’s a great way to start your day. Don’t schedule too much. ** Sometimes we schedule things back-to-back-to-back, so that every minute of every day is planned out. That leads to stress and problems. Instead, schedule as little as possible each day, and leave space between events, appointments or activities, so that your day moves along at a more leisurely pace. Start getting ready earlier than necessary, so there’s no rush, and leave yourself time to transition from one thing to another. A more spaced-out schedule is much more relaxing than a cramped one. Have dedicated family times. Try to find regular times in your schedule when you do nothing else but spend time together as a family. For some people, dinner time works well — everyone sits down to dinner together as a family, and no other activities are planned at that time. For others, weekends, or maybe just one day of the weekend, work better. We reserve Sundays as our Family Day, and try our best not to schedule anything else on that day. It’s something we look forward to. Weekends in general are for our family, as are evenings — all work gets done on weekdays, before 5 p.m. Simple clothing. It’s best to buy clothes for your kids that will match easily — choose a similar color scheme, so that you’re not always digging through their clothes to find stuff that matches. Go through their clothes every few months to get rid of stuff that doesn’t fit (kids grow so fast!) and donate the old clothes to relatives or charity (or pass them on to a younger sibling). Keep their wardrobe simple — if it doesn’t fit neatly in their drawers, you have to get rid of it or get rid of something else. Don’t stuff drawers, or you’ll make it hard to find stuff. Also, socks are usually a challenge — use mesh bags, one for clean socks and another for dirty ones. Then throw the dirty mesh bag in the laundry, and socks won’t get lost (or at least, not as often). Always prep early. I try to make it a point to look at the schedule in advance (usually the day before) to see what’s coming up. That allows me to prepare for those events or activities early, so that we aren’t in a rush when we’re getting ready. For example, on soccer days, we make sure that all the soccer gear, plus folding chairs and water bottles and snacks and whatnot, are all ready to go beforehand. Prepping early makes things a lot easier later on. Always bring snacks. Kids always get hungry. So be ready — if you’re going on the road, pack some snacks in baggies. Crackers, cheese, fruit, carrot sticks, PB&J sandwiches, graham crackers, peanuts, raisins all make good portable snacks. An insulated lunch container with re-usable ice packs help keep things fresh. Also always bring plenty of water, as kids are always thirsty. Can’t help you with the urgent bathroom breaks, though. Baby wipes and emergency kit. There will always be messes. Be ready. Baby wipes, even after they are past using diapers, are indispensable for all kinds of messes. Pack them in a little “emergency kit” that might include medical supplies, reading material, activities, a towel, and extra clothes — anything you can think of that might prepare you for anything that regularly arises. Pack spare clothes. We have a little carry-on luggage that’s always packed with a couple of changes of clothes for each kid — good clothes (for a party or something), regular clothes, underwear, socks. This way we’re always ready, if there’s an accident, or should they want to spend the night with grandparents or a cousin while we’re out at a party or something. It’s indispensable. Create weekly routines. Aside from regular family times (mentioned above), it’s good to have a weekly routine that’s written out and posted somewhere everyone can see it. A weekly routine might include regular practice times, house cleaning day, washing the car, yard work day, errands day, recurring appointments, etc. This makes the schedule more predictable for everyone, and eliminates a lot of surprises. Communicate as a family. Regular communication between family members solves a lot of problems. Have regular times when the family can talk about family issues. Dinnertime is a good time for that. We also have a weekly “Family Meeting” where we all sit down and talk about household issues, we compliment and thank each other, we plan our Family Day, and we play a fun game at the end. Go on dates. If you have trouble finding alone time with each child (whether you have one child or more than one), setting up “dates” can be a good way to ensure that you do things together. Make a date with your child for a specific day and time, and together you should decide what you want to do on that date. It can be something simple, like taking a walk in your neighborhood or in a park, reading together, playing board games, sports or video games, or it can be something like going to a restaurant or movie or amusement park. If you have lots of kids, you might have to rotate dates with them. Create alone time for your spouse. It’s easy to become so busy with your kids that you forget about your significant other. Don’t let this happen — it’s a sure way to drift apart and lose that bond that led you to having a family together. Keep the relationship alive by getting a babysitter (maybe once a week) and doing something together, just the two of you. Let things go sometimes. I’m not always good at this, but it’s something I work on constantly: don’t always be so strict. Let things go. They’re kids — let them live. I have a tendency to be very strict about things, but I remind myself constantly that it’s not worth all the hassle to get on their cases about things. Instead, let things go, and just relax. They’ll turn out just fine in the end, as long as you love and support them. Make decluttering a family event. I like to set aside one day every few months when we go through all the stuff in our rooms and declutter. We do it together, and it can be a bonding time. We end up with trash bags full of junk, boxes full of stuff to donate or give to family, and in the end, much simpler rooms. It’s very satisfying. Spend quiet time at home. Often we get so busy that we’re on the road all the time, going to one thing or another. And when we have family time, that’s often spent on road too — going to movies or restaurants or other fun events. But that can be exhausting, and expensive. Instead, try to spend time at home as often as you can. You can watch a DVD instead of going to the movies, and pop some popcorn. You can play board games or go outside and play a sport. You can read to each other, or by yourselves, or tell stories. There are dozens of things you can do at home that cost nothing, and that are relaxing and fun. Create traditions. Kids love traditions, from holiday traditions to family traditions. My mom likes all our kids to come over before Christmas to make Christmas cookies, or come over before Easter to color eggs. The kids love those traditions. You might also create some traditions at your house, whether that’s a family dinner time, Family Meetings or Family Day, or anything that brings you together. If you make it a regular thing, and give it special importance, it will be a tradition, and it will be something your kids remember into adulthood. Make cooking and cleaning a family thing. Cooking and cleaning can be complicated things, and they can take your time away from your kids. Doing these activities as a family solves both problems — having everyone pitch in can really simplify cooking and cleaning, and it gives you quality time together while teaching your children valuable life skills. Make it fun — let them choose recipes, go shopping for ingredients with you. See how quickly you can clean the whole house — if my whole family pitches in, we can do it in about 30-40 minutes. Make everything a game or a challenge. Reduce commitments. This tip applies to both your commitments and your kids’ commitments. If you have too many, your life will be complicated. If you reduce your commitments, your life will be simplified. It’s that simple. Make a list of all your family’s commitments and see which ones align with your priorities, and which ones are the most important. Which ones give you the most joy and benefit? And which ones just drain your time and energy without giving you much back in return? Keep the essential commitments — yours and your kids — and eliminate as many of the rest as possible. Get active. These days, kids can become very inactive (and unhealthy) with all the TV, Internet and video games they consume. Get them active by going outside with them and taking walks, going for swims, playing sports. My family likes to play soccer or kickball. Play freeze tag. If you run, let your kids run with you, at least part of the way. Get them bikes and go to the park. Do challenges, like races or pushup or pullup challenges. Make it fun, but get them active. How does this simplify your life? It means they consume less media, which in my opinion is a complicating factor. And even better, it gets them healthy in an inexpensive way, reducing your healthcare costs down the road. Focus on doing, not on spending. Too often we send messages to our kids about how to live life, based on what we do: we like to go shopping, and eat out, and go to the movies, and so our kids learn that having fun means spending money. We focus on material things, and therefore so do they. Instead, teach them (by talking but also by your actions) that what’s important is doing stuff, not buying stuff. Go for walks in the park, play outdoors, play board games, read, tell stories, play charades, cook and clean, go to the beach or lake, build stuff, wash the car. Spend quality time together, doing stuff that doesn’t cost money.